MOSCOW, April 17 (RIA Novosti) - The Russian Orthodox Church is observing Good Friday on April 17, with church services dedicated to Jesus Christ's crucifixion and burial. This day is considered the most sorrowful day of Holy Week and of the liturgical year, with the Savior crucified and accepting his death on the cross to save people from sin. John's Gospel says: "For God so loved the world, that he gave his only begotten Son, that whosoever believeth in him should not perish, but have everlasting life." There is no liturgy in Christian churches on Good Friday. 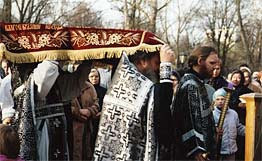 In Orthodoxy, an icon or embroidery of the Shroud is taken out of the chancel in the afternoon and placed in the middle of the church, with believers remembering the Passion of Christ; the Shroud stays in the middle of the church until the beginning of Sunday's Easter liturgy. The fasting period before Easter in Eastern Christianity lasts 48 days. The first 40 days of the period are called Lent, symbolizing Jesus spending 40 days in the wilderness being tempted by Satan. They are followed by Lazarus Saturday, commemorating Jesus raising Lazarus of Bethany from the dead, and Palm Sunday, when Jesus entered Jerusalem, and then by Holy Week, the last week of the fasting period. Holy Week lasts until Easter Sunday but does not include it. On Easter Sunday, Christians commemorate the Resurrection of Christ. The purpose of the fasting period is for believers to prepare themselves, through prayer and fasting, for Easter, Christianity's most important feast. This year, Roman Catholics and Protestants celebrated Easter on April 12 due to differences in the calendars used by Eastern and Western Christianity.